Whilst the majority of our lift projects involve design, installation or modernisation, we also regularly decommission and remove elevators. The context for such requests is normally the re-purposing of a building, its demolition, or the planned installation of new vertical transport. Over the years we’ve removed and disposed of lifts from both empty and occupied building such as apartments, schools and public buildings. We will be removing and disposing of four 16 person, 6 stop lifts from a redundant office block in Kew. The passenger lifts are no longer required as the building is being converted into high end luxury apartments. The Tower Lifts team has extensive experience planning and managing every aspect of this kind of project. This may include bringing in contractors for building or electrical works as part of the process of facilitating safe lift removal. If you are looking for a lift removals company with an international reputation, call Tower Lifts to find out how we can support you. Survey. This includes an assessment of the condition of the lift, a risk assessment, and a statement detailing the method of removal and the environmental hazards we will be managing at every stage. Lift Removal. Managing every aspect of the lift decommissioning and removal. Disposal of Parts. Lifts must be disposed of safely. The Tower Lifts team will break up the parts and legally dispose of them. Disposal of Oil. We will safely and responsibly dispose of hydraulic fluids and mineral oil as controlled waste. Should you be transporting your lift for use in a new location, we can also manage this process for you. Why Work With Tower Lifts? 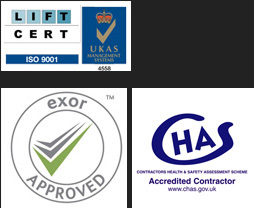 We’re internationally recognised as a leading lift design, installation and removal business. Over the past two decades our engineers have created bespoke lifts for the domestic, industrial and commercial sectors. We’ve worked in heritage properties, industrial plants, shops and domestic environments, often installing lifts in extremely challenging circumstances. At the heart of everything we do is passenger safety. Our engineers are highly skilled experts, with years of experience in building, installing and decommissioning lifts.